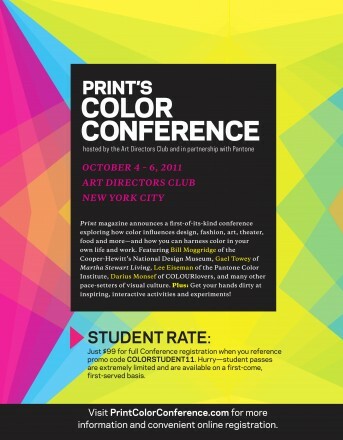 Print magazine is holding a Color Conference from October 4-6, 2011 hosted by the Art Director’s Club in NYC. The conference costs $595, but we have arranged for students of Color Theory to have a $99 pass. The students will need to register with the code: COLORSTUDENT11. “Print magazine announces a first-of-its-kind conference exploring how color influences design, fashion, art, theater, food and more—and how you can harness color in your own life and work.